Scott Guerini selling his book at Parliament House. 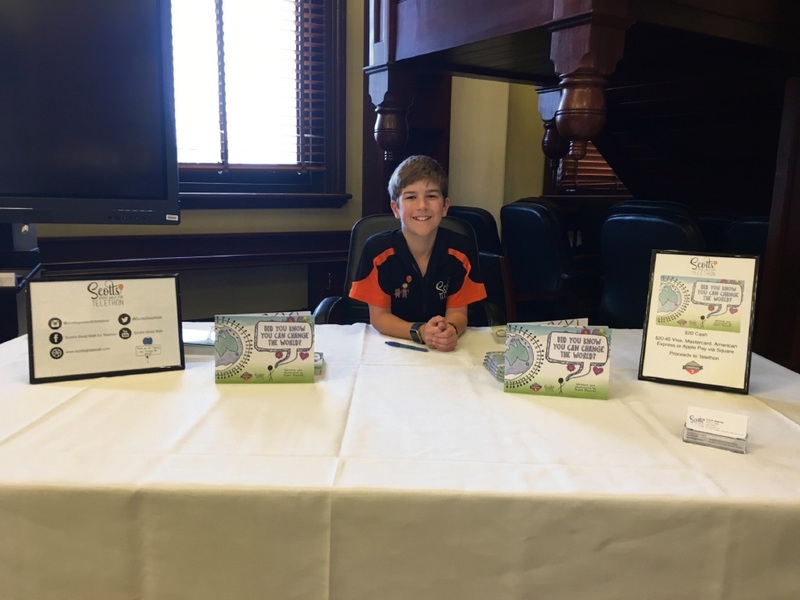 ALKIMOS boy Scott Guerini (11) set up a book signing table at Parliament House recently to raise funds for Telethon. The St Simon Peter Primary School student wrote Did you know you can change the world? based on his experiences fundraising for Telethon since he was four. Youth Minister Peter Tinley invited Scott to Parliament after meeting him at the WA Young Achiever Awards in May. Speaking in Parliament, Mr Tinley said the young award winners were “some of the most inspiring and humbling West Australians” he had met. Scott completed his first 25km walk from his family farm to Southern Cross when he was four and has steadily increased the distance each year, covering marathon distances in the past three. His family also did an 82km hike of the Rocky Mountains last year and he has raised more than $116,000 for Telethon since 2010. “Scott is 11 years old – most kids of that age are concerned with finding their way through the sometimes confusing maze of school, friends and family,” Mr Tinley said. “Scott has received numerous awards and twice won the Premier’s Australia Day Active Citizenship Award. Scott said politicians bought a dozen or so copies each to distribute to schools in their electorates and one copy was added to the Parliament library collection. “I thought that was pretty cool,” he said. His mother Nicole said they still had copies of the book to sell and would set up stalls at markets after Scott’s Great Walk for Telethon on July 15. Mrs Guerini said the Alkimos Sprout Hub had also awarded him a Seedling Fund grant to start running workshops with other children centred on the book’s theme. “They will create their own piece of art about how they will change the world,” she said. To buy the book, visit www.scottsgreatwalk.com.